A Young Genius in Old Egypt is the exciting story of Senefer, an African child in ancient Egypt. 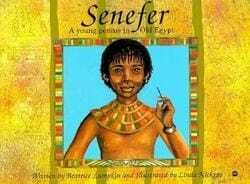 Senefer was a carpenter's son who became a famous mathematician and engineer. The story of his adventures brings to life the rich culture of ancient Egypt and the African tradition of excellence in mathematics and science. Senefer's love of numbers shows young readers that mathematics can be fun. Other role models include, Nefert, Senefer's mother who taught him how to value work, and the female Pharaoh of Egypt, Hatshepsut.